When Lehman Brothers bank went under, the world gasped. One of the world's biggest and most successful banks, its downfall was the event that sparked the slide of the world economy toward a Great Depression II. This is the gripping inside story of the dark characters who ruled Lehman, who refused to heed warnings that the company was headed for an iceberg; the world-class, mid-level people who valiantly fought to get Lehman off its disastrous course; the crash that didn't have to happen. A news-breaking explanation that answers the question everyone still asks: "why did it happen?" Larry McDonald, a former vice-president at Lehman Brothers in charge of distressed debt trading and convertible securities, was right at the centre of the meltdown of the company and gives an intimate look at the madhouse that Lehman became. This book shows beyond a doubt that Richard Fuld, the long-time CEO of Lehman, and his top executives, were totally out to lunch, allowing Lehman's risk profile to reach gargantuan proportions. 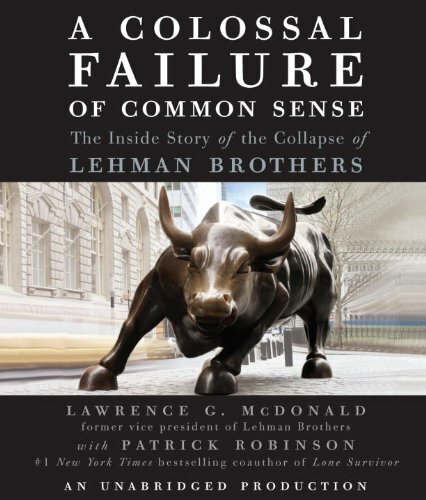 While the traders, like Larry McDonald, clearly predicted more than two years in advance that the market for packaged subprime mortgages and credit default swaps would evaporate, the high-flying Lehman bosses pushed hard on the gas pedal until the very end. View More In Company Profiles.